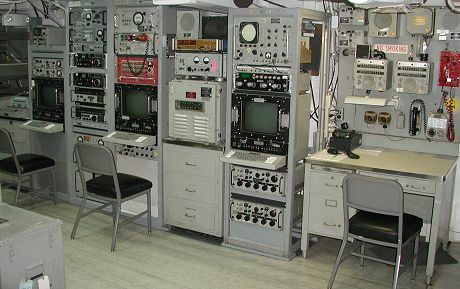 The radio room on the USS Missouri Battleship is now being operated by the Battleship Missouri Amateur Radio Club. The main antenna KH6BB uses is the broadband discone on the bow (in the red square above). If you are a licensed ham and would like to help operate the station, see the KH6BB listing on qrz.com. For an aerial view of Pearl Harbor and the ship, go here. For a photographic tour of Radio Central and the various antennas on the ship, go here. QSLInfo: KH6BB QSLs 100% on receipt of a self-addressed stamped envelope (SASE). The QSL is a standard 3.5 x 5.5 inch card so oversize envelopes are not needed. 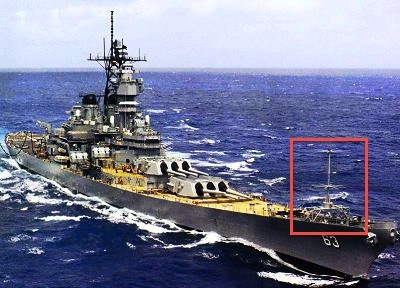 Mailing address is: Battleship Missouri Amateur Radio Club 98-1547 Akaaka St Aiea HI 96701-3051 USA.